Wednesday, October 16th, 2013. CD17, 1DPO. Have you guys seen the movie Pitch Perfect? Anyway, this post is brought to you by my love for this movie. And acupuncture, herbs, and all things TCM. Progress is being made in a big way over here, and I am about to get all OMG YOU GUYS HAVE TO TRY THIS on you for a minute. So the first cycle I met with Dr. McStabby, I was about halfway-ish through the month, so his treatments couldn’t have had much of an effect on my cycle length at that time. That was my August cycle, and I ovulated on cycle day 21 that month. Auntie Dearest showed up ten days later. September, the first full month of treatment, I ovulated on cycle day 19, and had an eleven day luteal phase. Still not the greatest, but you know… progress. And here we are in October, the second full month of my TCM treatment, and I just ovulated. On cycle day 16, you guys. That’s amazing, right?! I mean, in two months’ time, acupuncture and herbs, along with some dietary and lifestyle changes, have effectively moved my ovulation date up almost a WEEK!!! Needless to say, I’m pretty stoked, both that this treatment path that I regularly refer to as “Chinese voodoo” is a legitimate, medically effective way to impact infertility, and that my body is responding – and responding well! Now, I have to point out that many women need to follow the dietary and lifestyle guidelines, take their herbs consistently, and see their acupuncturist at least once a week for a good three or four months to see noticeable changes like this, so if you’re considering trying out the TCM lifestyle, plan on committing to at least six months of treatment. Some women notice changes right away – there are several women in my FertilityFriend acupuncture group who became pregnant within a month or two of starting treatments! That’s great, don’t get me wrong, but it’s not the norm by any means. The average woman in that group who has gotten pregnant using only acupuncture and herbs, has done so in the third or fourth month of treatment, sometimes later, but noticed some differences, even small ones, sooner. The fact that I’m in line with the rest of the class as far as noticing these differences makes me feel pretty spectacular. Oh, and you know what else makes me feel spectacular? NOT BEING LOADED UP ON HORMONES. NOT EATING ALL. THE. THINGS. NOT BEING HATEFUL AND RESENTFUL OF PREGNANT WOMEN. FEELING SPECTACULAR MAKES ME FEEL SPECTACULAR! Sorry for the OMGALLCAPS type-yelling. I’m just excited. You can’t be mad about that, right? 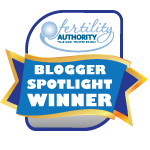 So really the reason for this post was to let you all know that if you’ve been banging your head against a wall with infertility treatments for a year, two years – God, four and a half years – maybe it’s time to give this a chance. If you’re like me, and you have the horrifying plague known as Unexplained Infertility, acupuncture and Traditional Chinese Medicine are very real, very effective treatment options. …And Western medical treatment options aren’t the be-all end-all, either. Look around, call around, and see what else is out there, especially if you feel like you’re not making any progress with meds and ART. YOU COULD BE THAT GIRL. Give it a shot (pun. intended. )… You could be a TCM success story!